Who Is the Teacher In that Photo? 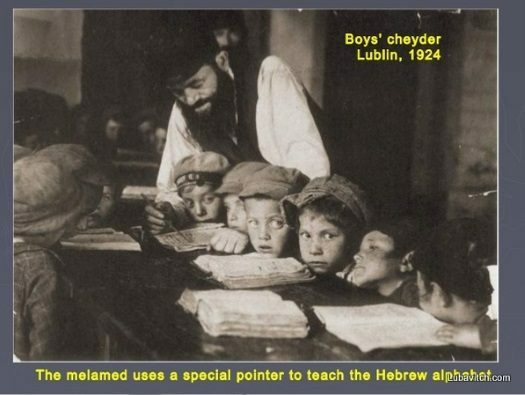 Four generations later, a Swedish Jew traces his roots to a Melamed teaching his pupils in an iconic black-and-white photo taken in the Polish town of Lublin in 1924. 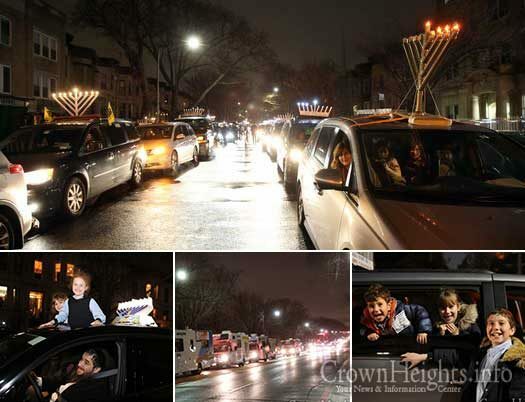 Hundreds of Menorah-topped-cars and dozens Mitzvah ‘Tanks’ participated in a massive parade Monday evening, leaving from Crown Heights and traveling through the streets of Manhattan and spreading the light of Chanukah. 6-foot tall, 150 lb. menorah stolen from Washington Square in San Francisco’s North Beach. 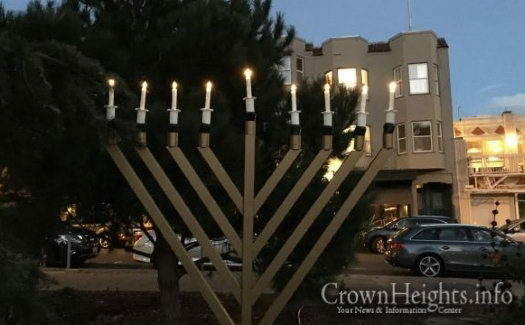 A 6-foot tall menorah was stolen from Washington Square Park in San Francisco over the weekend. 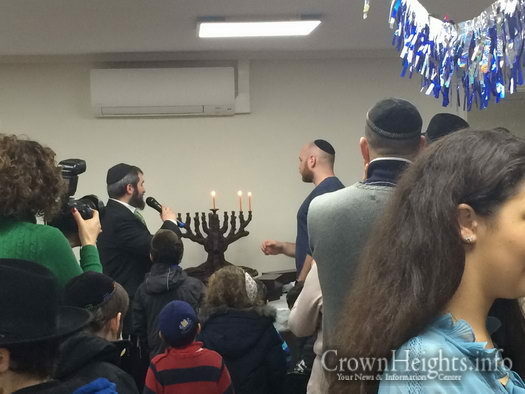 It was last seen on Friday, December 23, by Rabbi Peretz Mochkin of the North Beach Chabad. 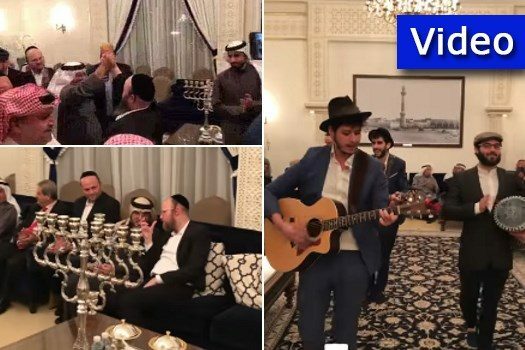 It was a menorah lighting like no other, with a Chasidic rabbi dancing hand in hand with a kafiya-clad Muslim man in the tiny Persian Gulf country of Bahrain, located off the northeast coast of Saudi Arabia. 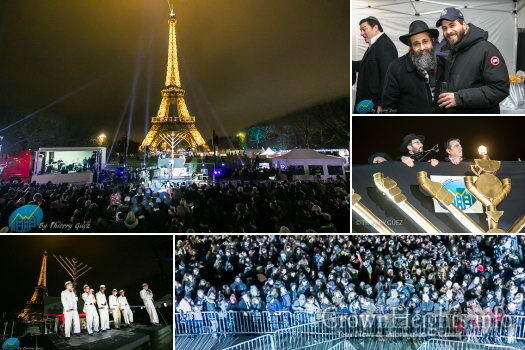 The second light of the Menorah was lit Sunday night in the Champ de Mars park in Paris, underneath the Eiffel Tower, with thousands of people in attendance. 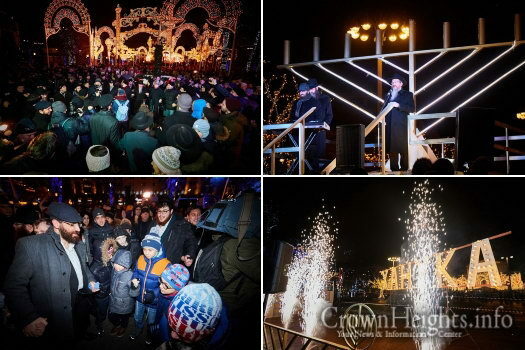 Chabad of Essex, UK, kicked off the first two nights of Chanukah with two Menorah lightings in two towns, which – despite the clash with local holidays – brought out huge impressive crowds, showing the true strength and real Jewish Pride which often lays beneath the surface of this community. This is the twenty fifth year in a row that the Chief Rabbi of Russia, Rabbi Berel Lazar, lit the Chanuka candles in Moscow’s Red Square, and every year he feels the same surge of excitement as he pronounces the words “she’asa nissim la’avoseynu bayamim hahem bizman hazeh.” When the crowd roars “amen” in reply, the words echo and reverberate off of the Kremlin fortress. Appropriately enough, it was the flame-topped wicks swaying high above Milwaukee Avenue that brought singing and dancing to the streets of Chicago’s famous Wicker Park neighborhood. 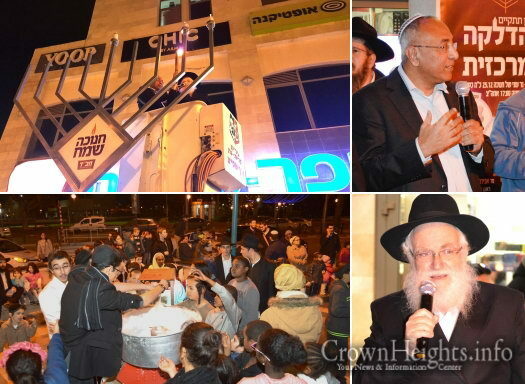 The Mayor of Kiryat Gat, Israel, Mr. Aviram Dehari, joined the pubic Menorah lighting hosted by Chabad in a show of solidarity to the Rov of the city, Rabbi Moshe Havlin, who has been the target of a harassment campaign in recent months by opponents of the IDF draft of Orthodox Jews. 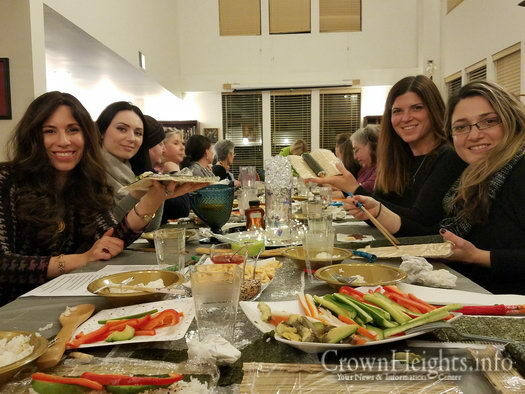 Sushi-making and holiday giving were the themes of Chabad of Orange County’s recent Women’s Circle event at the Chabad Center in Chester, NY. 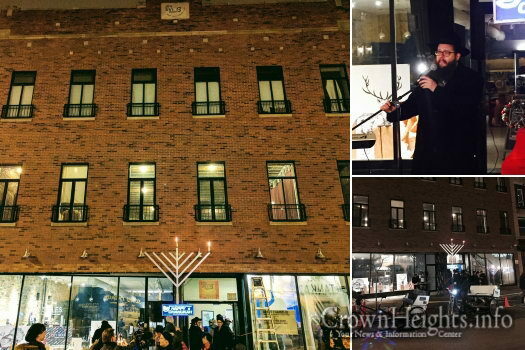 A Chabad center in S. Monica, California, was found vandalized with feces on Sunday, the first day of Chanukah. 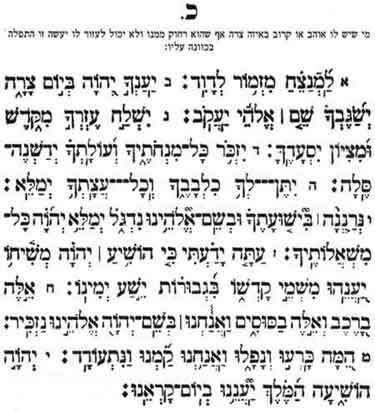 Please take a moment and say a Kapital Tehilllim for Liora Rochel Chaya bas Sara, who is in need of an urgent Refuah Sheleimah. Join in completing the Tehillim in merit of her complete and speedy recovery, Click Here to participate. 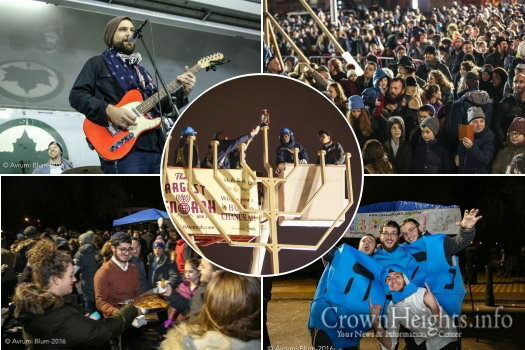 A visit from New York City Mayor Bill De Blasio and a rocking concert by the Moshav band enthralled some 1,000 people who packed into the pedestrian area at Grand Army Plaza for the lighting of Brooklyn’s Largest Menorah. 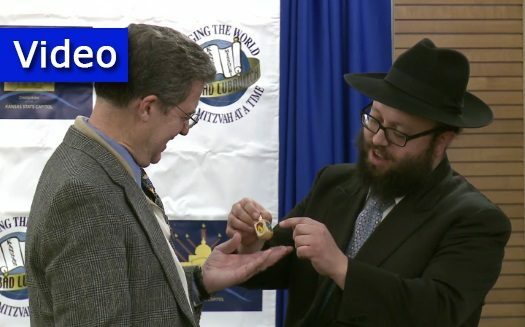 Rabbi Zalman Tiechtel presented Kansas Governor Sam Brownback with a custom-made dreidel during a Chanukah celebration at the state Capitol.